The MV Cagivou vessel carrying pre-poll election material and Fijian Elections Office staff has arrived at its destination in Lau. The vessel which departed Narain Jetty yesterday was delayed due to unfavourable weather conditions at sea. 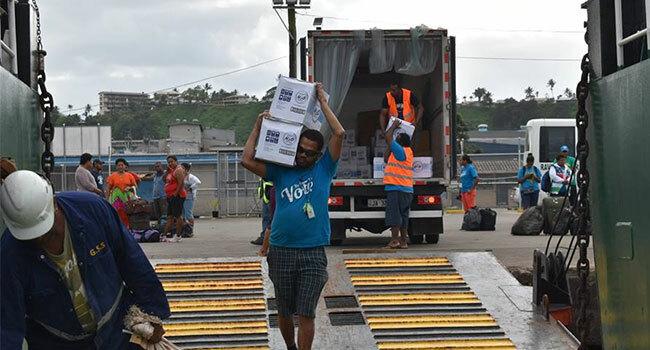 The FEO in a statement says polling for these venues will commence as soon as the staff are able to disembark the ship and reach the respective polling locations. It says it had anticipated a likelihood of such event and had therefore only allocated five venues to be in poll today by staff in the ship at the respective times by the respective teams. The FEO is in a position to reschedule polling today to ensure that routes and the venues for tomorrow are unaffected by the weather that prevailed today. Polling will commence as and when the teams are on ground and will ensure that all scheduled venues are completed on time. The scheduled polling for tomorrow will remain as advertised earlier. The venues planned for pre-poll include Namuka-i-Lau, Komo, Moce and two venues in Oneata. Meanwhile, the FEO conducted pre-polling at 138 venues around the country with a total of 15,609 voters expected to cast their vote today.